Syllabus of the Online Course (Subject): Islamic Development Bank (IDB). Istisnaa. Sharia. Learning materials in or Banco Islámico Desarrollo Banque islamique du développement. The Islamic Development Bank is an international financial organisation created by the Declaration of Intent issued by the Conference of Finance Ministers of Muslim Countries held in Jeddah in 1393H (December 1973). The Islamic Development Bank was formally opened on 15 Shawwal 1395H (1975). The official language of the Islamic Development Bank is Arabic. The goal of the Islamic Development Bank is to promote economic development, international trade and social progress of the members of the Islamic Development Bank and the Muslim communities individually as well as act in agreement with the principles of Shari'ah (Islamic Law). The Shari'ah is the set of rules derived from the Holy Quran, authentic traditions (Sunnah) of the Prophet (peace be upon him) and scholarly opinions (Ijtihad) which are based on the Holy Quran and Sunnah. The present membership of the Islamic Development Bank consists of fifty-six countries. 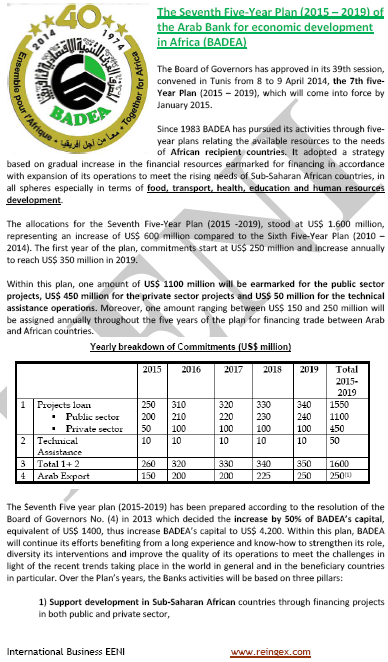 The Islamic Development Bank Group will focus on the following six preference areas. Headquartered in Jeddah (Saudi Arabia), the Islamic Development Bank Group also has three regional offices in member countries: Almaty (Kazakhstan), Kuala Lumpur (Malaysia), and Rabat (Morocco). The Islamic Development Bank opened its fourth regional office in Dakar, Senegal. The Islamic Development Bank has field representatives in thirteen member countries Bangladesh, Guinea, Guinea-Bissau, Indonesia, Iran, Libya, Mauritania, Nigeria, Pakistan, Senegal, Sierra Leone, Sudan, and Uzbekistan. 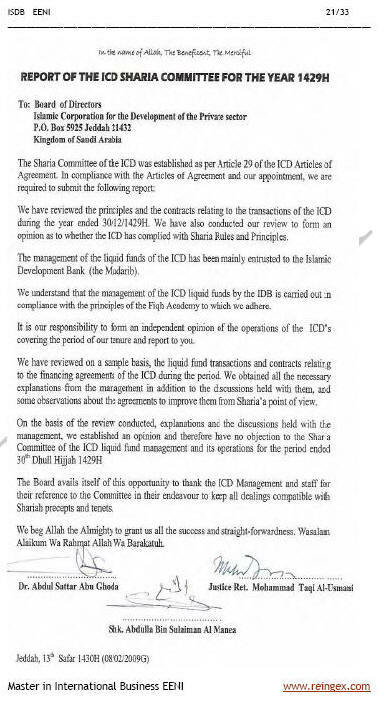 Islamic Development Bank - Unit of Account (Islamic Dinar). 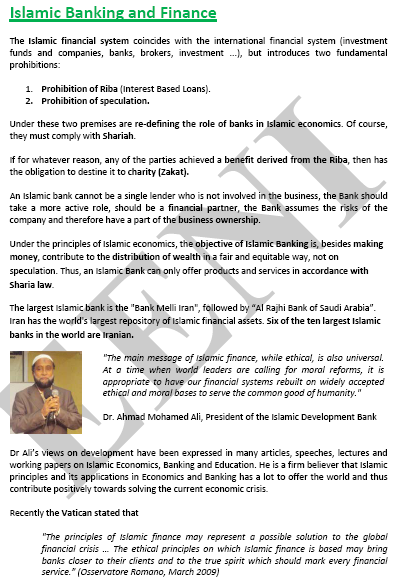 A unit of account of the Islamic Development Bank which is equivalent to one Special Drawing Right (SDR) of the International Monetary Fund (IMF). The composition of the currencies in SDR basket denominating in Islamic Dinar is USD 44%, Euros 34%, GBP 11% and JPY 11%. The Islamic Development Bank Group offers a broad spectrum of financing and development schemes: project financing, International Trade financing, insurance in agreement with principles of Shari'a (Islamic Law) financing modes. 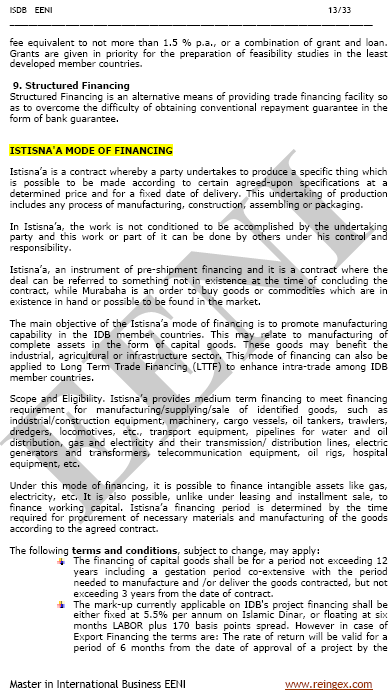 The Istisna'a finance mode allows providing financing for manufacturing and/or distribution of identified products (equipment, civil works). Istisna'a is a contract whereby a party undertakes to produce a specific thing which is possible to be made in agreement with some agreed-upon specifications at a determined price and for a fixed date of delivery. This undertaking of production includes any manufacturing, construction, assembling or packaging process. The Islamic Corporation for Insurance of Investments and Export Credits was created in 1415H (1994) with the objective to broaden the amplitude of regional trade transactions, and foreign direct investment flows among the member countries of the Organisation of Islamic Cooperation. The Islamic Corporation for the Development of the Private Sector is a multilateral organisation, affiliated with the Islamic Development Bank Group. Its shareholders are the Islamic Development Bank, forty-five Islamic member countries, and five public financial institutions from member countries. The goal of the International Islamic Trade Finance Corporation is to promote trade between the Islamic Development Bank member countries through providing trade finance and engaging in activities that facilitate intra-trade. The Arab Bank for Economic Development in Africa (BADEA) was created under the decisions of Sixth Arab Summit in Algeria on 28th November 1973. The Bank began operation in March 1975 with its Headquarters in Khartoum, the capital of the Republic of Sudan. The Islamic Development Bank belongs to Islamic Civilisation and African Civilisation.